The second of 3 7'' singles released for the first Ricked Wicky LP, I Sell the Circus. Each 7'' on Side B contains an exclusive track written by Nick Mitchell, guitarist of Ricked Wicky and newest member into the ever expanding Pollardian army. In this way, the limited singles offer a Pollard teaser for the new LP, while fans are left getting acquainted with a brand new ballgame on the flipside. Mobility- Same track that appears on the LP I Sell the Circus. Check out the review over there. 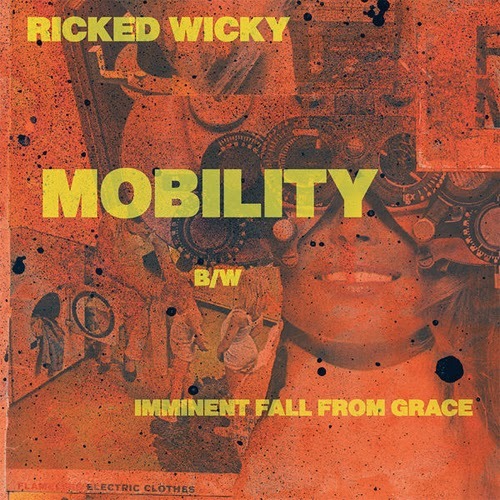 Imminent Fall From Grace- 2 The second showing in the singles series from Ricked Wicky guitarist, Nick Mitchell. A full band rocker after the sparse song off the Death Metal Kid 7''. The song is an upbeat poppier affair, but Mitchell's vocals sound far too polished. The vocal delivery gives the song an unwelcomed Bon Jovi at karaoke. Although musically decent, this feels almost too far removed from the Pollard universe.